The Roman Catholic Church on Belle Isle was represented by the Dwyer and Kent families. From the early 1800's the Roman Catholic adherents were in the majority of the population of Belle Isle, as they are today. In the fifteenth century, explorers were accompanied by priests and friars, whose desire was to convert the heathen of those far away lands. From church records, dating as far back as 1770, one can readily see that the religious aspect of life was woven strongly into the fabric of these early pioneers. It would appear that for years these early settlers and their children were without a resident clergyman or any religious guidance. Yet, from the annals of church history, we find numerous records of the Belle Isle faithful taking their children to Harbour Grace, Port de Grave, Portugal Cove, and St. John's to be baptized. Up until the beginning of mining in 1895, there were but two denominations on Bell Island Reverend William Whitley visited Portugal Cove and baptised some children from there and Belle Isle. Between 1837 and 1838 Reverend J. Forristale baptized a number of children from Belle Isle, among them were Jane, of Edward Kent; Bridget, of James Kelly; and Andrew, of Andrew Murphy. John, son of Dennis Dwyer, was one of the first children to be baptized on Bell Isle. A small church was built as a Mission Chapel and served the needs of the parish for a number of years. This little chapel was located on the same site where St. Michael's stands today. Belle Isle, along with Topsail and Torbay, was part of Holy Rosary Parish, Portugal Cove The parish experienced considerable growth during the nineteenth century, partly due to the large influx of Irish settlers. The first resident parish priest of St. Michael's Parish was Reverend Richard Dunphy, who served his growing flock from 1875 to 1880. Reverend Dunphy was followed by Reverend Lawrence Vereker, 1880-1884; who was succeeded by Reverend Francis McCullow, 1884-1892. Reverend Patrick O'Brien served the parish from 1892~l896. 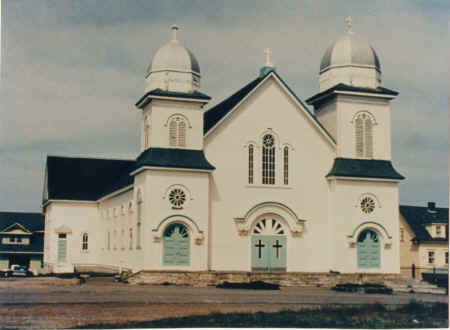 Although the Roman Catholic congregation at Lance Cove was without a regular church building for many years, this did not prevent the holding of services. Whenever the Parish Priest from Portugal Cove was able to get up to Lance Cove a service was held. Before the time of the service, many of the faithful could be seen walking over the road and lanes towards the home of Mr. James and Mrs. Ann Hammond. One of the main attractions of that home was its huge fireplace. Another was that it had two sets of stairs -one was a winding stairs that led up to a large living room. This living room was known as the "big room." Behind its glass door was where the services were held In this room the large Bible was read, sermons were preached, communion was served, and confessions were heard. There are no Vital Statistics Volumes (DPHW) available for this Parish They do have the All Newfoundland Births - Vital Statistics Division microfilm available for this parish at the PANL for the period from 1891 to1926 for baptisms and from 1891 to 1922 for marriages. The death records for St. Michael's Parish start from 1891 onwards There are also microfilms at the PANL from the Vital Statistics Division from 1891 to 1949 for deaths. Sacred Heart Roman Catholic Cemetery located on Lance Cove Road, Bell Island.